Experience our luxury 4 bedroom beachfront house, with incredible ocean views and expansive indoor/outdoor living spaces. This home offers large master bedroom suites each with private terraces, closets, and elegant bathrooms with amazing tropical garden showers. 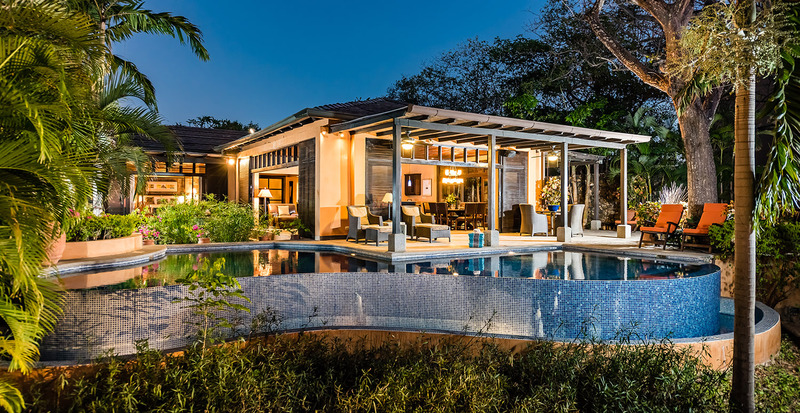 This home also enjoys membership to Tamarindo’s only exclusive beach club with beach front pool, a gym, yoga studio, 5-star restaurant, and full concierge service. The residence is located on your own beach front lot. Enjoy the privacy of home living with the benefits of a being part of the Tamarindo Preserve gated community. Take a look at our calendar on HomeAway to see Casa Tranquila’s available dates, talk directly with the house manager and book your stay. 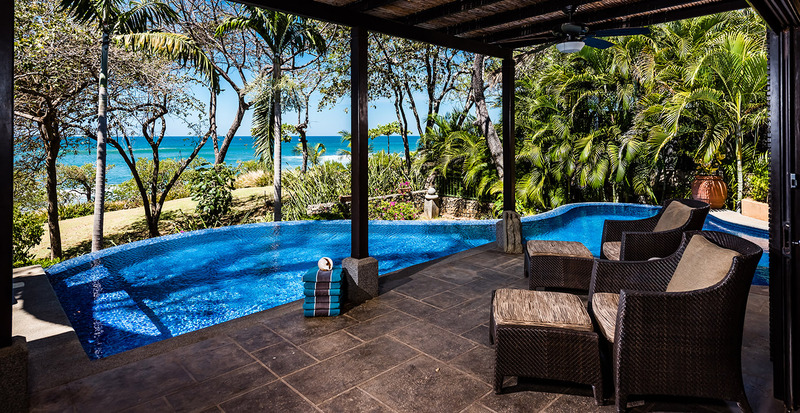 The Tamarindo Preserve is the only beach front gated community in Tamarindo, with all the quality and amenities of a world class resort, yet just a short walk from the chic and trendy beach town center. This home is among the world’s finest, secure within a gated community and surrounded by the natural beauty of the ocean, forest, and estuaries of the Pacific coast. Live the “Costa Rican” lifestyle in the fun town of Tamarindo, where alongside the golden sand beaches you’ll find a plethora of restaurants, shops and entertainment venues. 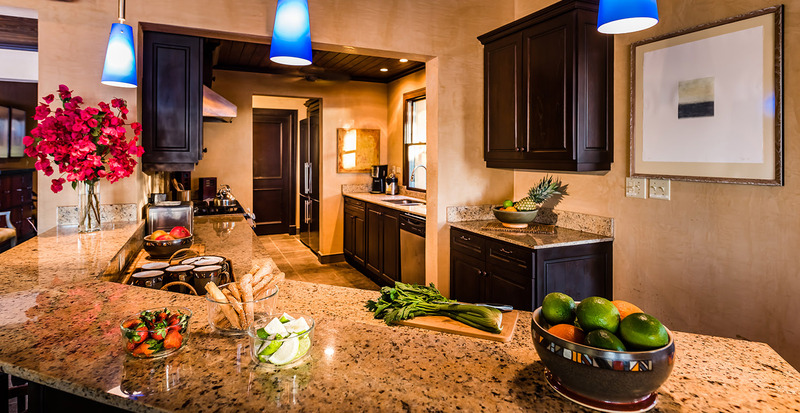 Much like a typical gated community, the Beach Club at Tamarindo Preserve offers you a full concierge service, a gym, a yoga studio, a beach front infinity edge swimming pool and a 5-star bistro restaurant. The Beach Club is located on the best stretch of beach in the area and was selected for its beauty and safety. You will enjoy a breadth of activities and entertainment that the quirky beach community of Tamarindo provides just a short walk from home. We had such an incredibly wonderful, adventure filled vacation in Costa Rica! Casa Tranquila proved to be beyond perfect! 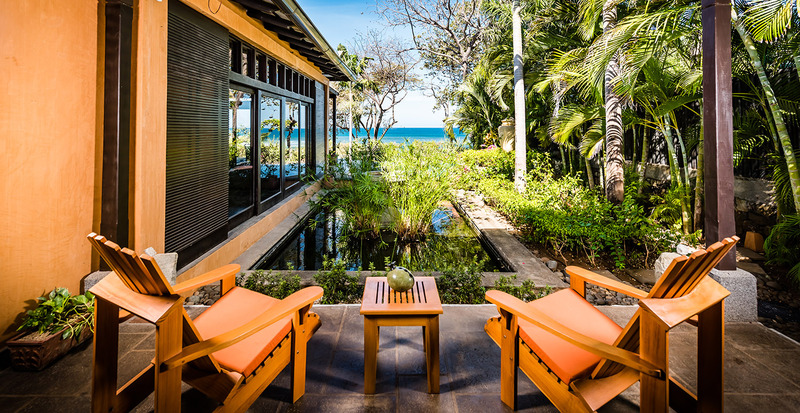 This beautiful Balinese-style home opens to a courtyard of lush landscape and koi ponds, providing tranquility and privacy to the four bedrooms. All the beautifully appointed bedrooms have on suite baths with outdoor, private “courtyard style” showers. The kids could not have been more thrilled to have “their own” outdoor showers. The living and dining areas are spacious with ample seating both inside and out. We definitely did not take full advantage of the gourmet kitchen and outdoor grill as we dined out most of the time, but there is always next time! The house is large enough that we could have brought another family with us! It is ideal for two families or several coupes. The infinity pool was nice to have, even with the beautiful beach but steps away. We spent countless hours soaking up the sun with an incredible view of the ocean. There are so many adventuresome activities to choose from in Costa Rica, and this was a perfect home base, close to all the action. Surfing, zip lines, tours, horseback riding, natural parks, ATV riding, fishing, river and jungle tours to name a few. 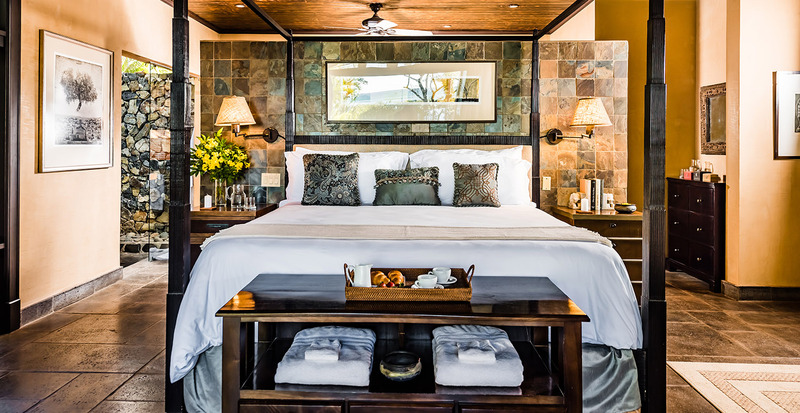 Casa Tranquil is the perfect complement to fun filled, active days –peaceful, relaxing and luxurious. The staff was exceptional, they treated us wonderfully. The housekeeper did our laundry and dishes, total vacation! Daniel started as our tour guide, concierge, activity planner, driver and photographer and ended up being our friend. Thank you, Daniel. We had such a great week! We cannot wait to return!!! The beachfront home is simply stunning, nicely appointed, yet very livable. Large windowed sliding doors in the main living area let in the ocean breeze and natural light. The views over the infinity edge pool to the Pacific Ocean are worthy of a travel magazine cover. The bedrooms were large as were the adjoining bathrooms. A treat was the professionally maintained grounds and potted plants which add to the beauty of the home. Our favorite feature is the large patio, which wraps around the home. It has multiple sitting / lounging areas, which allows everyone personal space. Off the kitchen, you will find an outdoor dining table and grilling area. From the patio, we drank our morning coffee, ate breakfast, read, sunbathed, took naps, drank a few Imperial beers, rocked in the porch swing, watched the mist from breaking waves and grilled dinners. Our kids voted the patio at Casa Tranquila as the “The Best Place in World to Watch the Sun Set”. Casa Tranquila is a terrific place to base your Costa Rican vacation. Tamarindo is a laid-back surf town, but has everything you need; a large assortment of restaurants, grocery stores and pharmacies. The home is so nice and relaxing, we had a hard time venturing out. When you choose to go into town, walk down the beach and take in the amazing views, then take a cab back to the home. All aspects of the rental process were professional and prompt. Daniel is your local liaison and is a huge asset to the home. He is a native Costa Rican, speaks excellent English and we loved all his suggestions for excursions and restaurants. I could not give Casa Tranquila a higher recommendation. John L. - Flower Mound, TX. My husband and I spent a week here in this beautiful home. I have always wanted to stay some where warm and on the beach; this is perfect. It is very private and cozy. We took a few days of touring the area, including horseback riding, ATV tour, hiking the rain forest and a day of golf. We definitely recommend this home to any one that wants to get away from it all and relax or go on daily outings! It is all there. It perfect for couples or families! Something for everyone. The home is very open but warm and cozy. I especially liked the master bedroom where you can lay in bed and watch and hear the ocean. Susan B. - Barryton, MI. We loved the home and the location. It was such a great experience that we will definitely come back again! Ellen G. - Roanoke, VA.
We couldn’t have been happier with the customer service we received. The house was fantastic and the process was so easy. Can’t wait to go back! Bill W. - Steilacoom, WA. Loved the view and getting to walk straight to the beach from the house!!! And it was so close to town. The whole family had a blast! Martha M. - San Francisco, CA. It isn’t easy to find a location this great. It was so close to the beach, but still close enough to town. The amenities of the Beach Club were wonderful, yet the house is very private. I have been recommending this house to all my friends. George J. - Salt Lake City, UT.